Last year ended in an ultimate high. I completed my firs half Iron distance triathlon see this. I was at my peak endurance level, weight, body fat, eating healthy and making a ton of healthy home-made meals. And then, well…. I needed a break! After my race we traveled to Arizona where my husband along with many team mates completed their full Ironman!! There is where I began to take time off, not only from exercising but also from cooking and eating so healthy. I felt I needed it. I had been very strict on my eating habits for over a year without a break and I had every intention of enjoying these holidays without any guilt feelings. Now that a few months have passed and got that out of my system, I’m ready to re-start my usual habits. It didn’t take long for me to feel “gross” due to the food I was eating and crave my home cooking. I took time of endurance exercise and began with Bikram yoga and weight training. Now I have incorporated more running and cycling. Here’s the first new recipe I try since my hibernation began, hehe. Oh and my first try at cooking a whole chicken too! This recipe is from 100 Days of Real Food. 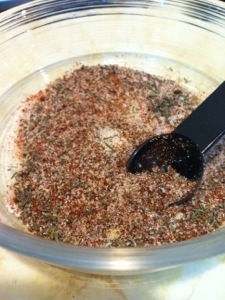 -Combine the dried spices in a small bowl. 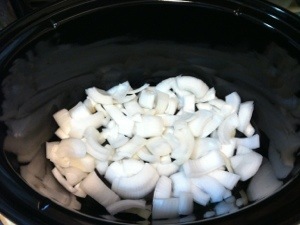 -Loosely chop the onion and place it in the bottom of the slow cooker. -Rub the spice mixture all over. You can even put some of the spices inside the cavity and under the skin covering the breasts. 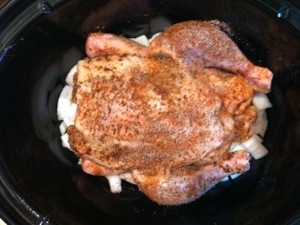 -Put prepared chicken on top of the onions in the slow cooker, cover it, and turn it on to high. There is no need to add any liquid. 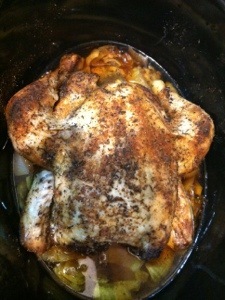 -Cook for 4 – 5 hours (for a 3 or 4 pound chicken) or until the chicken is falling off the bone.